Non slip rug underlay is an essential element of the carpets, rugs and kilims adorning your home. Carpets, rugs and kilims are becoming more and more accepted and favored because they are a celebration of human skill and artistry from around the globe. They provide a remarkable opportunity to proclaim your uniqueness and lend your home a fresh, exhilarating global flavor. Protecting and making rugs and carpets safe for use is a necessary part. Rugs and carpets are mostly made of wool, cotton and silk which make them slippery. Therefore, rugs, kilims and carpets have a tendency to skid on the floor. This is irritating and may also be cause of accidents. Adults or children when step on the rug, may slip and fall because there is nothing to hold the slippery rug in position. Also frequent crease and wrinkles on the rugs may cause someone to trip and fall over. Non slip rug underlay guarantees superior protection and eliminates these risks that rugs pose. They get a tight grip on the floor so that the rug stays fixed in its place and does not skid all over. It erases all creases and wrinkles. Rug underlay maximizes the luxury of rugs by making them warmer and cozier. They also protect the rugs which increases their life. Vacuuming and cleaning a rug becomes easier with the underlay. Rug underlays are singularly useful for rugs and carpets laid in shops, corridors and such places where they get trampled most of the time. At Rug Store, we know the effect a luxurious, comfortable and soft rug has on you. Our assortment of special non slip rug underlay is designed keeping this aspect in mind. 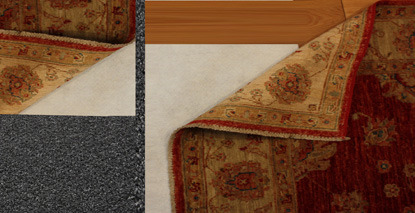 We have rug underlays suitable for rugs, carpets and kilims of any shape, size and quality. Our experience, expertise in this field is exemplary. A dedicated and supportive staff is at your service to help you get the best underlay for your rug and make your home a statement of safety and luxury.